With all the cafes, sweets shops and patisseries around the city specializing in all sorts of baked goods, it's fairly easy to locate a venue offering the colorful and flavorful French treats—macarons. If you have yet to sample these meringue-based delicacies, you're in luck. There are many places throughout New York City where you can stop by to get your macaron fix. A variety of macarons from numerous NYC patisseries. Not to be confused with coconut macaroons—Parisian macarons comprise of egg whites, a blend of icing and granulated sugars, plus almond powder or ground almond. Slightly moist and light enough to melt in your mouth, these baked treats come in an array of bright, pastel or deep hues and flavors. And the finished product consists of a pair of dome-shaped macaron cookies that sandwich ganache, buttercream or jam fillings, plus other ingredients, depending on the venue's preferences or creativity. Opening its doors nearly a year ago, Mille-Feuille delights residents and passersby in Greenwich Village with an array of macarons, including salted caramel, which is their most popular flavor, shares Olivier, owner and pastry chef. 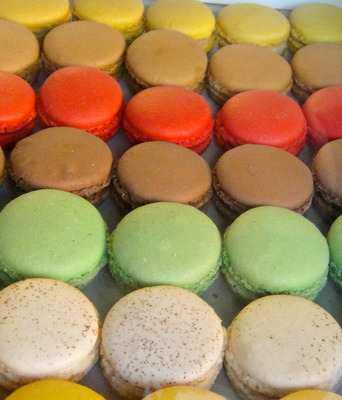 Macarons come in various colors and flavors. Patrons dropping by this French bakery and café find that aside from macarons, other treats are also served. "Actually, we are also known for our croissants, too!" Olivier adds. "Also our fine French pastries, including our version of the Mille-Feuille." The latter is better known as Napoleon in American English, which is among the all-natural baked sweets Olivier and his staff create in their open kitchen. Open kitchen with Olivier and staff making some goodies. Mille-Feuille is at 552 Laguardia Place (between 3rd & Bleecker streets). Adding to their repertoire of more traditional flavors, Macaron Parlour Patisserie mixes things up by offering fillings ranging from buttercream and ganache, to savory and frozen dessert varieties. Be sure to try their candied bacon with maple cream cheese frosting, or S'mores fillings. The first venue to offer S'mores and candied bacon cream cheese frosting macarons. Located at 101 Stanton Street (between Ludlow & Orchard Street), bisous ciao. specializes in a variety of macaron flavors. Are you looking for something tasty to give as a gift? Peruse the shelves for an idea or two. Check out the goodies on store shelves at bisous ciao. Macarons on a stick, given out during Macaron Day 2012. Sample some macarons and other goodies created by French pastry chef, Damien Herrgott, while enjoying coffee, wine or beer within a peaceful setting. Or, select from over 100 loose tea flavors that come from eco-sustainable and fair trade farms, which have been developed by tea master, Kiley Holliday. Enjoy your drinks and macarons at the counter. With various locations in New York City, Francois Payard Bakery provides delicious French macarons, fresh bread and pastries, plus a variety of sandwiches for those who want to dine onsite, or anyone on the go. Branch at 210 Murray Street (between West Street & North End Avenue). Oh, so many macaron flavors, including rose lychee, pistachio and chocolate. Francois Payard Bakery sells wraps, pastries and more. Have some tarts, macarons, cake and eat 'em, too. There are numerous options all over New York City where you can purchase and enjoy these delicious French treats. Where is your favorite place to get macarons?